We've chosen the black gum (Nyssa sylvatica) for our October Tree of the Month. 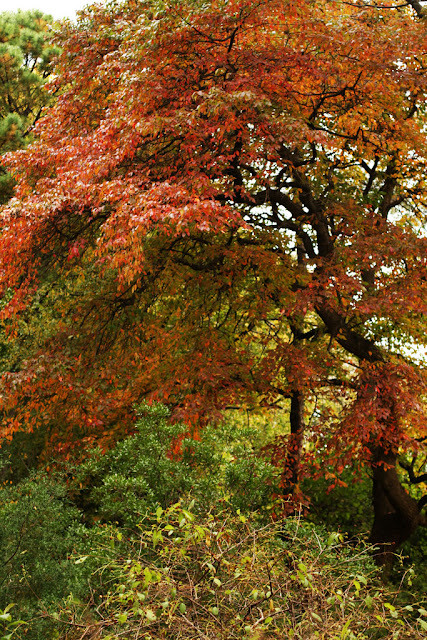 Its leaves turn vibrant red in early autumn, before most other tree species put on their fall color. In the District we may not see the bright change until the end of the month, but it is a notable tree to look out for. 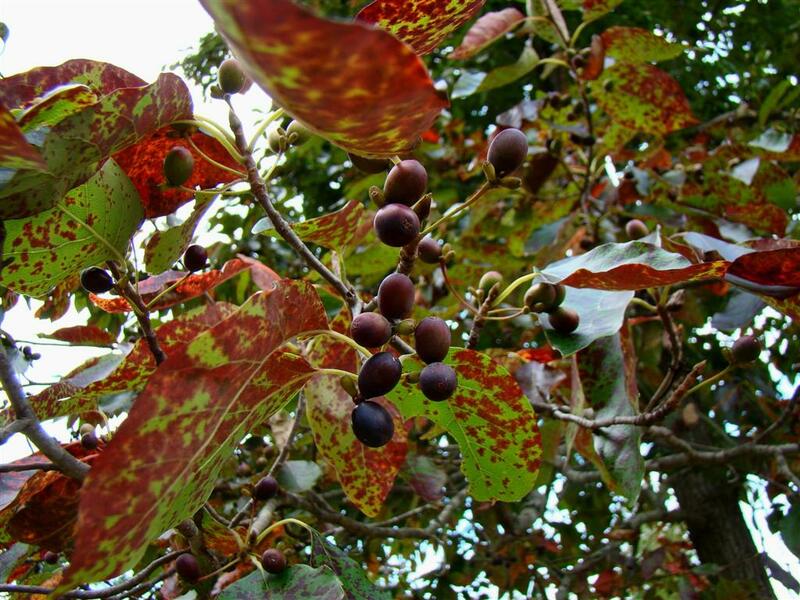 The black gum — also called black tupelo or sour gum — is a native tree found throughout eastern North America, from Southern Ontario and Maine all the way to Florida and Texas. It is a medium-sized deciduous tree, usually maturing at a height between 66 and 82 feet. A black gum's brilliant fall color stands out against more late-changing leaves. Photo credit: dogtooth77. Dark and furrowed bark. 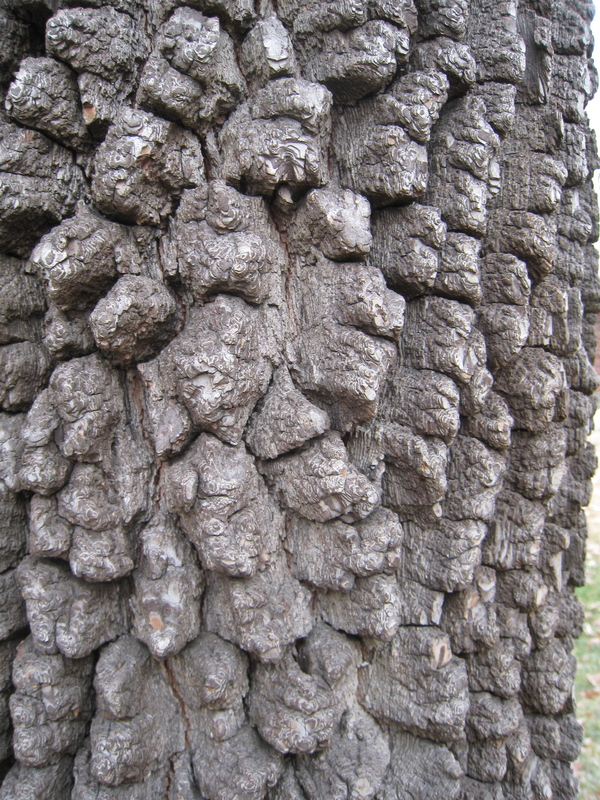 Some black gum bark resembles the scales of an alligator, making it particularly easy to recognize. Leaves, which are simple and oval-shaped with a rounded base. Dark green and glossy in the summer and peach or wine-red in the fall, the black gum's leaves are typically about two to six inches long. Small and greenish-white flowers, appearing in springtime with the leaves. Fruit, which blossoms when the leaves change color. Due to its early arrival, the sour fruit of a black gum attracts a lot of birds in early autumn. Though black gums prefer swampy areas and highly acidic soil, you can find them in various locations around D.C., including at the National Arboretum, the Kenilworth Aquatic Gardens, the White House south lawn and Rock Creek Park. During spring season, the black gum qualifies for our RiverSmart Homes program!